Business Calendars - The Most Effective Promotional Product! PCD calendars are all about "added value". 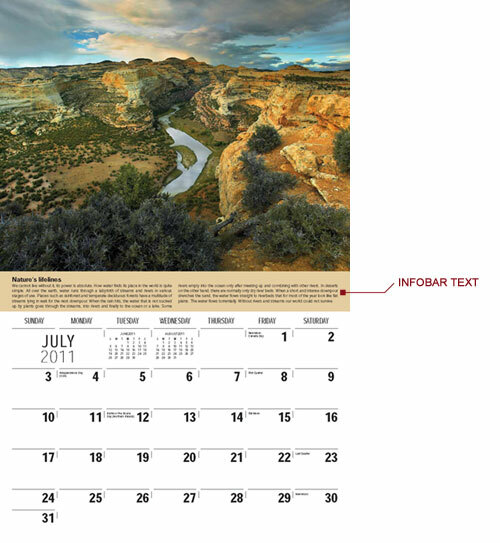 In addition to the obvious competitive advantages of outstanding photos and images, easy-to-read datepads, and contemporary designs, we offer 18 of our titles with added informative text we call InfoBars™. InfoBars™ are monthly text blocks which provide information which further complements the illustration or passes along interesting facts, tips or suggestions. InfoBars™ range from automotive maintenance tips, to health tips, to golf tips, all the way to facts about ecology, exotic animals or foreign destinations.